Bio: Master thief wants to steal everything (and has the skills to do it). What a great name this guy has! Chop Shop. If you'll forgive me a moment's pretension, names like this are what makes Transformers resonate to me. Sounds great when you say it too. Chop. Shop. Chop Shop. CHOP SHOP. Brilliant. It's a name that's full of character and intent. Lacking any real knowledge about the character and with just that anemic bio to go on (hooray for multi-lingual packaging and not being bothered to Wiki this guy! ), I've got him down as one of those guys who runs those stolen car/insurance fraud outfits. You know, that old school take two write-offs and weld them into one and stick 'new' plates on the thing. Except on Cybertron. And with giant robot ...stuff. So, Chop Shop here is one of four Transformers toys originally released in 1985 known as 'The Deluxe Insecticons', a name that screams luxury and high class. What it actually meant was that some forgotten Japanese robot toys that wound up in Ban Dai's inventory were licensed by Hasbro to keep up with demand for Transformers product. 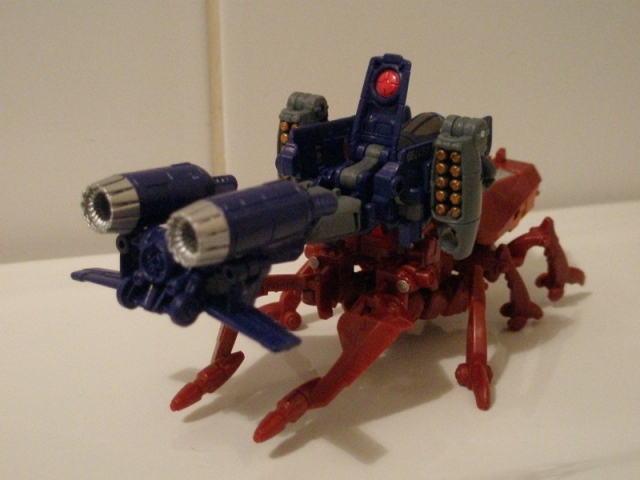 As with a lot of early Transformers of this nature, their stylistic differences to the main bulk of the line made them stand out a bit and not really fit, aesthetically, with the other Insecticons. Or other Transformers toys. I don't know much about them either. Living in the UK, they never showed up over here, save for a few panels in Time Wars where they were quickly dispatched without saying a word. As with a lot of other toys of this ilk, they're stupid expensive on the aftermarket, so I'd pretty much given up on tying to acquire even one of them. So thank the Matrix that over the last few years, Hasbro have been squeezing as many bankable repaints out of each individual mould as is humanly possible � something which is reaching a nadir for the current Combiner Wars line - as this now means I own my very own Chop Shop. This makes me very happy. This is my happy face. Chop Shop is a repaint and minor retool (he has a new head) of the Generations 'Thrilling 30' Insecticon Skrapnel, one of the universally exalted Legends-sized figures from that line. 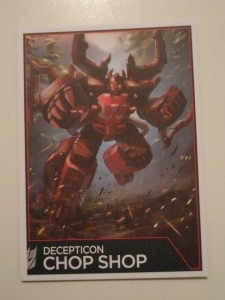 Instead of a Targetmaster partner, Chop Shop comes with a spiffy art card (I like these). Yeah, this is awesome. Chop Shop looks deadly. He's this really striking reddish-brown colour all over, with bright orange blocks of colour on his shins and chest, plus a few accents around his head. Some flashes of silver adorn his head and the vents on his legs, plus a few blocky swipes of white to make his orange chest look interesting (if only something like this had been done on Viper). The largely monochromatic scheme is something that would usually have me moaning about stingy paint apps and what not, except this is exactly what Chop Shop looks like, so there's not much to complain about on that front. Maybe some red to pick out his eyes? Love all the sculpted detail on this guy too, its just right! Enough to make him interesting without being too busy. Proportionally he looks good, but you do quickly notice how bloody massive his hands are. Look at them! They're bigger than his head! All the better for grabbing and stealing you with though. 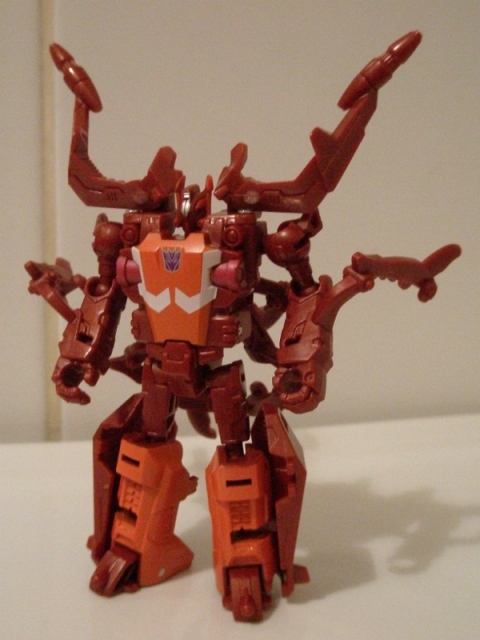 A suitably fierce looking Stag Beetle, Chop Shop looks awesome. 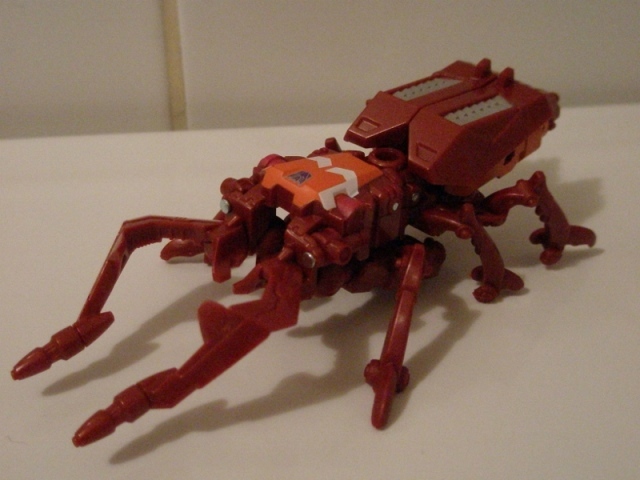 As with a lot of Transformers with beast alt modes, he has little in he way of articulation, so you have to use your imagination to have him crawl about doing insect-y things. That's right kids, there's no app for that, so you'll have to think for yourselves when playing with this toy. Only thing I don't particularly care for are the moulded static wheels on the legs. A carry over from Skrapnel, these make absolutely no sense. I get that its 'ooh homage Geewun', but c'mon, its not like an insect mode needs wheels, as deftly proven by Combiner Wars Bombshell. And every insect Transformer since 1995.